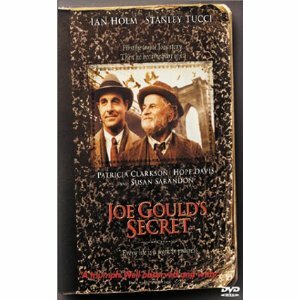 This is the wonderful story of both Joe Gould (Ian Holm) and Joseph Mitchell (Stanley Tucci). While the former was a noted street person of New York's Greenwich Village back in it's real Bohemian days, the latter was a former newspaper reporter for the Morning World, the Herald Tribune, and the World-Telegram, eventually landing at The New Yorker as a feature writer, with an emphasis on eccentric people in New York City. But, beneath their superficial differences, these two men were both really the same. Joe Gould, with his superior intellect and intelligence, did not fit in with the world in which he lived. He was educated, and on occassion, could be most charming. But his usual modus operandi was to roam about the city, ranting and raving about the "aural/oral History" that he was writing. This history was to be comprised of the everyday conversations of the people with which Mr. Gould found himself interacting with during the course of his daily rounds to his usual haunts. He claimed that these conversations held more insight into the human condition than all the history books combined. And, in a way, he was right. A quick look at Studs Terkel's books, especially "Working" and "The Good War", which are both "oral histories", lends creedence to this. Mr. Gould's play on words notwithstanding, the "aural/oral" histories are both pretty much in the same genre. One is an overheard conversation (aural), while the other is a person speaking, either in answer to a question posed, or just telling their own story (oral). Both are valid, and insightful forms of history, and highly enjoyable for the reader. Joseph Mitchell also felt disconnected from the world into which he was born. Born to Averette and Elizabeth Mitchell, who were cotton and tobacco traders in North Carolina, and whose income would help support the younger Mitchell throughout his life, even while working at The New Yorker, he never felt at home there. After moving to New York in the 1920's, he married photographer Therese Jacobsen in 1931, and they would remain together for the rest of their lives. They had two daughters, Nora and Elizabeth. Mrs. Mitchell passed away in 1980,and Mr. Mitchell passed away in 1996. The film follows Mr. Mitchell as he embarks on a journey through New York in the 1940's, a time during which Allen Ginsberg was writing "Howl", and the McCourt Brothers were beginning their individual migrations to America. It was a time of coffee houses and poetry readings, beatniks and jazz. Fascinated by Joe Gould's intellect, as well as his way of making a living, Mr. Mitchell follows him to every party, poetry reading and failed interview. Along the way Mr. Gould solicits money for "The Joe Gould Fund", which is supposed to be a contribution towards the publication of his "Aural History", but which everyone knows is just money for Mr. Gould to eat and drink with. The real meat of this movie is in the similarities that draw these two vastly different men together. Eventually, after trying to get a look at the written portions of the "Aural History", Mr. Mitchell finds that there is no such thing. It is all a product of Mr. Gould's slightly skewed imagination. But Mr. Mitchell keeps the secret, and the legend, alive, going so far as to help others as they continue to search for the history, which he knows does not exist. With standout performances by both Ian Holms' as Joe Gould, and Stanley Tucci as Joseph Mitchell, this film captures the essence of a very special place and time in New York. The costume designs, sets and scenery are all superb, creating a flawless background to this unique, and true sory. David Streitfeld, a writer for the Washington Post, quoted Mr. Mitchell in Newsday, August 27th, 1992 as having said of his strange obsession with Mr. Gould; "You pick someone so close that, in fact, you are writing about yourself. Joe Gould had to leave home because he didn't fit in, the same way I had to leave home because I didn't fit in. Talking to Joe Gould all those years, he became me in a way, if you see what I mean." I do, Mr. Mitchell, and I believe that so many others feel the same way. Remember that Thomas Wolfe, another great writer from North Carolina, once wrote, "You Can't Go Home Again." And, in an uncanny sense of irony, this film serves to drive that point home.